I love connecting with readers! I'm happy to arrange an in-person visit with book clubs, community groups, libraries, writing groups, and classrooms; in those cases where a live visit in not feasible due to distance, I am happy to arrange a visit via Skype (or other similar video chat software). I'd be delighted to attend a book club meeting or speak to your community group, writing group, high school classroom, or college class. Visits last for about 45 minutes; usually the session begins with me introducing myself and sharing a story or two about my writing and my writing career. This is followed by a 20-30 minute Q&A session. If desired, the visit can include a five minute reading by me from one of me works, either at the beginning or end of the visit. For in-person visits, I am also happy to sign books. I'm happy to conduct in-person visits within New England if the timing allows me to travel to your location. Otherwise, I am happy to conduct a virtual visit vist Skype or other video chat technology (Go To Meeting, Zoom, Google+ Hangout, etc.) with groups anywhere in the world! Sometimes I get questions or concerns about what attendees will be "allowed" to say about my books (are they allowed to say they didn't like a particular book), the types of questions I'm willing to answer, or whether or not attendees are expected to purchase the book. A really great article on author visit etiquette can be found HERE, but, in general, when booking a visit with any author, yes, everyone attending should have read at least one of their books, yes, it is considered a standard courtesy for all attendees to have purchased at least one of the author's book for the visit (especially if the author doesn't charge an honorarium for their visit) (Hereafter is only $0.99 in e-book at the moment! ), and yes, it's okay to say you didn't like a character, a plot line, or even the entire book. Booking a visit is easy! Just fill out this Google Form to provide some basic information. Once I receive your email, I'll be in touch via email (so make sure you type your email correctly!) to finalize arrangements. If you don't hear from me within two weeks of submitting your request/form, please feel free to email me to follow up. 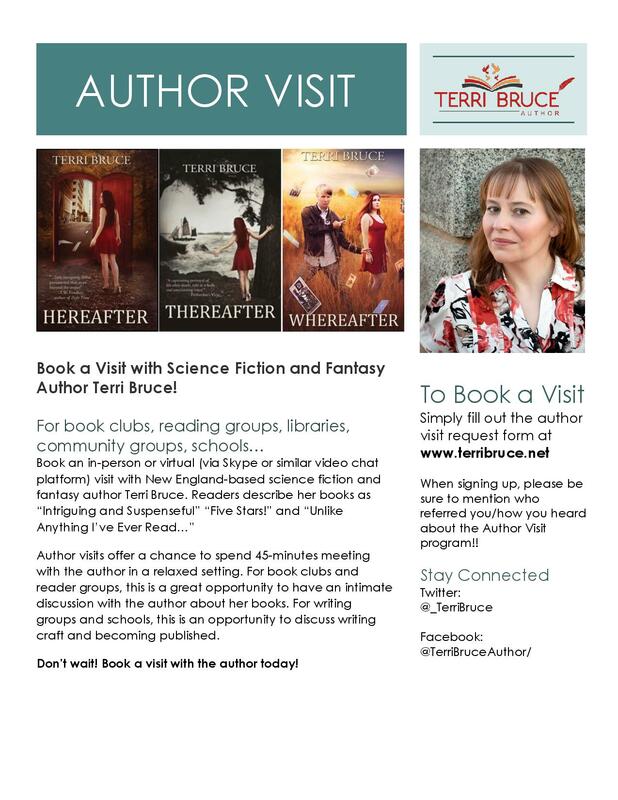 If you have any questions, feel free to email me at TBruce [at] terribruce [dot] net. I look forward to meeting with you and your group!